The SCALE-iDriver™ from POWER INTEGRATIONS, which is available at CODICO, is an innovative IGBT gate driver, and brings many benefits to a motor drive inverter. 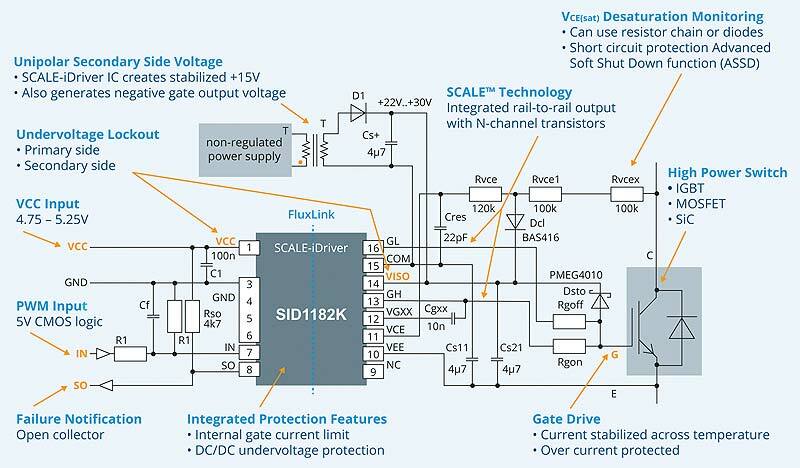 This document discusses the feasibility to reduce costs on system level by using this gate driver from POWER INTEGRATIONS™. The idea to work with a unipolar power supply to switch the IGBTs isn’t new. The problem so far was that the turn off voltage is 0V and not negative. Many designs failed in the past, because of parasitic turn on due to dV/dt in the system. The typical threshold voltage of an IGBT is around 6V. If a parasitic Voltage between Gate and Emitter occurs in the range of 6V the IGBT can turn on and lead to a system stop. The SCALE-iDriver™ has an integrated voltage regulator for the turn on voltage. This means the supply voltage can be a unipolar and unregulated 22V-30V supply (Vtot). The SCALE-iDriver™ generates a regulated +15V voltage to turn on the IGBT. The turn off voltage is the difference of the supply voltage and the regulated +15V. • No need of suppressor Diode for Gate Emitter protection (simple diode from Gate to +15V). Most motor drives use engine speed sensor or current sensors to get a feedback of the motor state. From a cost perspective these signals shouldn’t be transferred over an isolation barrier to a Microprocessor which is connected to a high voltage. For cost optimization – and in most cases also technical wise – the best solution is a Microprocessor on SELV level (earth potential) like shown in the picture on the right side. But therefore a reinforced isolated gate driver is needed. SCALE-iDriver™’s reinforced galvanic isolation is provided by Power Integrations’ innovative solid insulator FluxLink™. FluxLink™ is a magneto inductive technology to transfer the PWM command signals from the primary (IN) to secondary side. 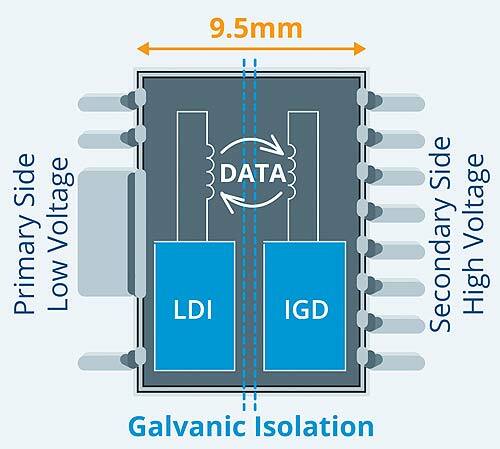 Thanks to this technology the SCALEREDUCE iDriver™ is providing safe isolation between primary side (LDI) and secondary-side also after the secondary side chip (IGD) has blown up due to an IGBT fail. 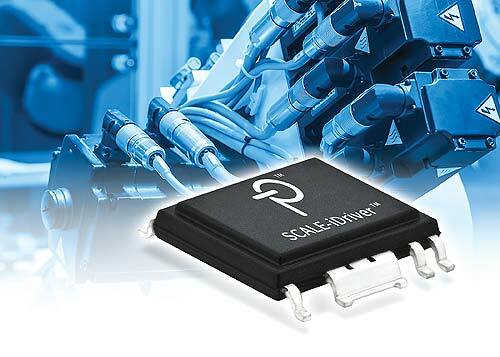 The SCALE-iDriver™ is available with 2.5A, 5A and 8A output so far. 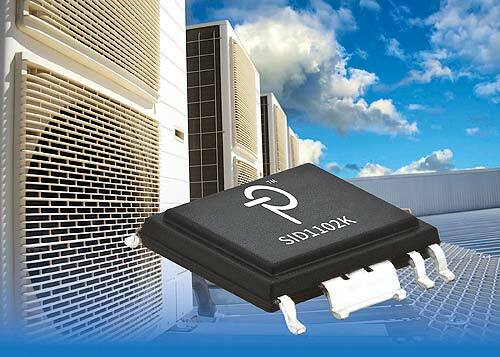 The 8A output is the highest output current for gate drivers available in the market. Until 8A no external booster is needed. This 8A are regulated and available over the full temperature range of -40°C to 125°C ambient temperature. For turn on and turn off current two separate Pins are provided. No external diode for splitting turn on and turn off current is needed. Regarding the internal current regulation over the full temperature range even no external gate resistor is needed. The SCALE-iDriver™ has an N-Channel-MOSFET output stage which leads to a very low output impedance. The output current can be higher by using the same gate resistors compared to another driver with same current rating. 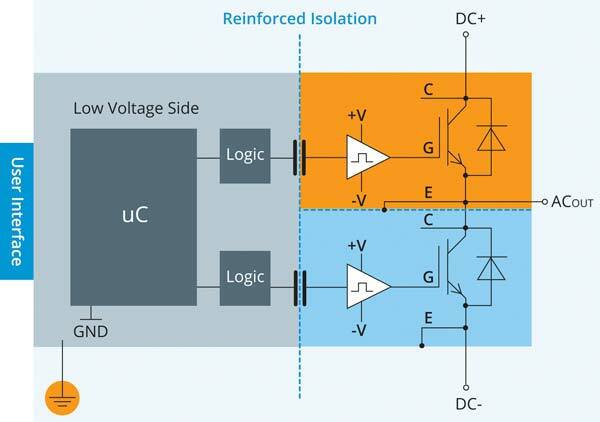 Measurements have shown that this can reduce the turn on (Eon) losses of an IGBT up to 70%. At the same time the turn off losses (Eoff) are still the same. Depending on the switching frequency and the design criteria for selecting the IGBT current this reduce of switching losses can lead to a smaller and so more cost efficient IGBT. Protecting the IGBT against overcurrent is a must have of every motor drive. In most IGBT applications the usage of a gate driver with De-saturation detection (DESAT detection) protects the IGBT against high current that would lead to a destruction of the IGBT. The principle is that an IGBT desaturates at roughly four times of the nominal current. Then the IGBT is getting high impedance and the Collector – Emitter voltage (Vce) will rise up to the DC-link voltage. DESAT detection can detect this voltage and the driver will safely shut off the IGBT. Unfortunately typical DESAT detection can lead to false tripping due to forward recovery – especially in applications with dynamic loads like servo motor drives- after the so-called blanking time. Therefore, most of the inverter manufacturers designed out the DESAT function and use other solutions like measuring the current with costly current sensors. A current sensor for every phase leg is needed, so three current sensors are required for a three phase inverter. Ideally, design should help to turn off IGBT before reach two times nominal current. This means a lot of engineering effort and also a software adaptation for every different motor drive is needed. The DESAT detection of the SCALE-iDriver™ provides a response time instead of a blanking time. Short voltage spikes are ignored and the DESAT detection can be used again for overcurrent protection also in servo motors. After a DESAT event is detected, SCALE-iDriver™ will turn off the IGBT with its patented Advanced Soft Shut Down (ASSD) function. 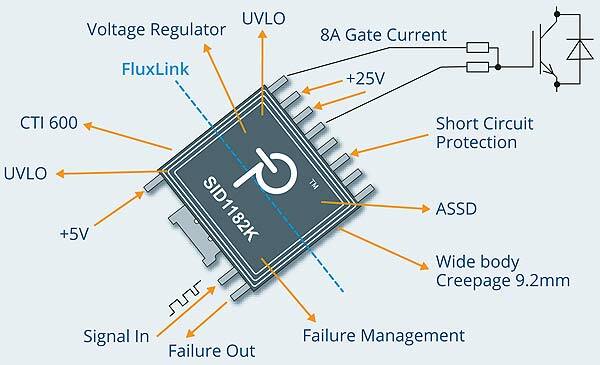 This ASSD principle is a closed loop Gate feedback which is working without any additional external components. The short circuit event will be reported by the SO pin to primary side. By handling the overcurrent with the driver it isn’t needed to know the current of each phase. The current of the three phase system could now be measured with the Aron measuring circuit which needs only two current sensors. 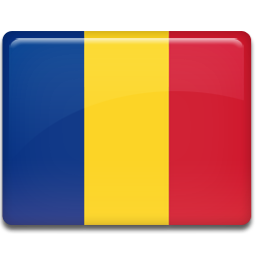 If you wish to receive more information in the product, please get in touch with your CODICO contact or Mr. Ivan Mitic, Regional Sales Manager at CODICO.